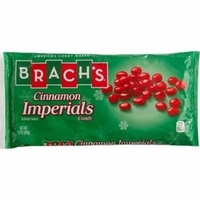 Brach's cinnamon imperials are a must have Christmas Candy. Tiny red chewy pieces with a spicy cinnamon flavor. They have a cinnamon flavored shell as well as a hard candy center. Even if you are not fond of hot candies, these are a delicious treat not to hot, but a nice cinnamon blast made with real cinnamon. Not only are these tasty just to eat right out of the bag, they are perfect for decorating your Holiday Cookies and treats. Add some to your coffee for a nice smooth cinnamon flavor. Did you ever try adding them to a home made apple pie? Yum they are very good that way and gives your plain apple pie a nice cinnamon taste.